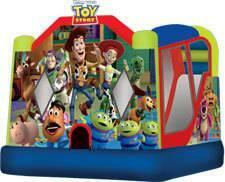 The exciting new tale of Toy Story 3 can be re-imagined in this all-inclusive Toy Story 3 Combo C4 bouncy house. This interactive bouncy house features the classic Toy Story characters, from Buzz and Woody to Rex and Hamm. Participants will spend hours jumping, sliding and exploring their own Toy Story 3 playroom! This Combo C4 bouncy house is part of an entire line of licensed Toy Story 3 products, and comes with all the accessories needed for a successful playtime event! This C4 bounce house combo offers up four different activities for endless hours of play. Each bouncy castle has a large interior jumping area and a basketball hoop for group interaction, and high-visibility mesh allows spectators to keep an eye on participants. The C4 jumper comes with a climb to conquer, along with a fun and fast wet/dry slide, for full-on entertainment for even the most active child! Each bouncy castle is manufactured with lite n strong™, fire resistant vinyl for safety, durability and portability, and comes with all the accessories.